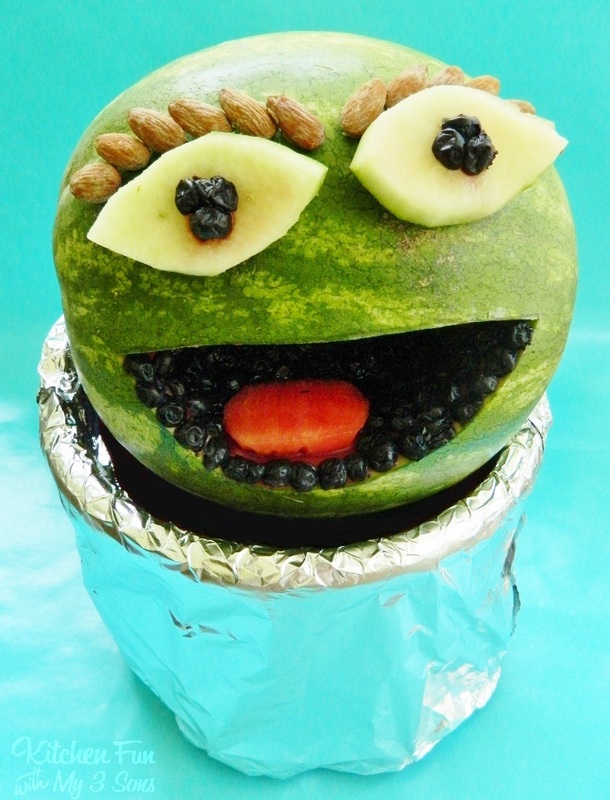 We had a watermelon that we need to cut up so my 9 year old suggested that we make it into Oscar the Grouch for my 2 year old. 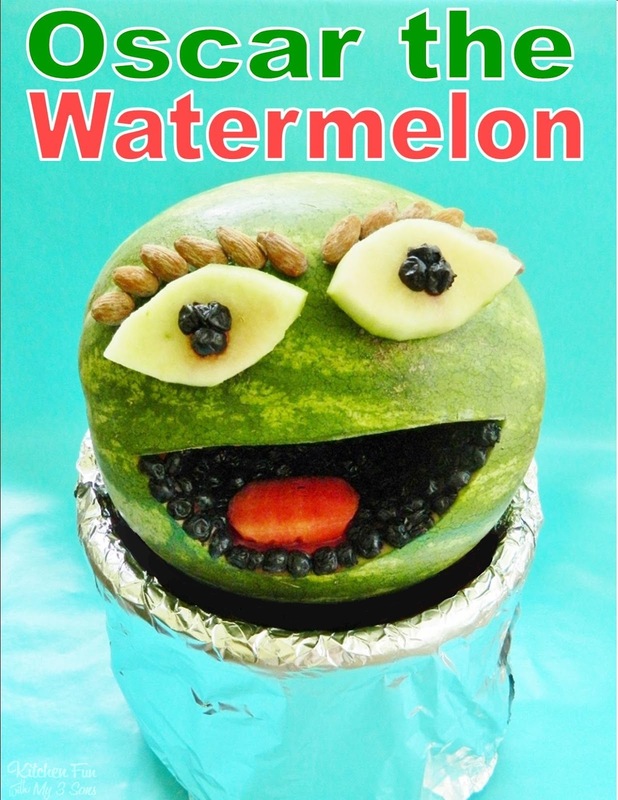 We love to make fun watermelons and have made several of them that you can view HERE! I think he had a fantastic idea and we love how it turned out! We used all fruit with a hand full of almonds. This would be perfect for a Sesame Street party. 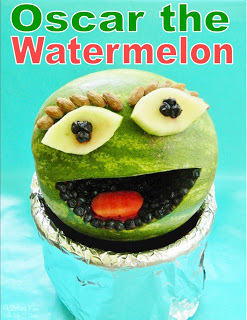 You can cut out the back, scoop out the watermelon, and cut into pieces to serve. This way you still have the fun face on the front & the kids can get the watermelon from the back side. Start out by drawing a mouth on the front then cut it out with a knife. We cut out a tongue from that piece of watermelon. We cut blueberries in half and lined them around the bottom & top. Make the eyes by cutting from the peel that you cut out for the mouth. We used blueberries for the pupils. Attach the eyes on with tooth picks. We attached almonds for the eyebrows using peanut butter. We covered a bucket with aluminum foil & placed a coffee can inside. Place Oscar the Watermelon on top and that is it!! 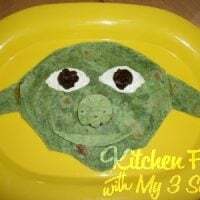 Here is my 9 year old with his fun Sesame Street creation…..
You can view all of our other Sesame Street fun food creations HERE! 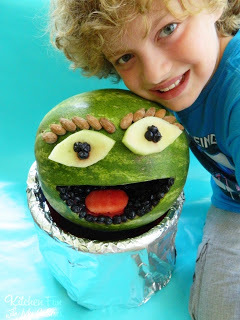 « Previous PostPotty Training Fruit Snack & Other Potty Treats! So cute!! 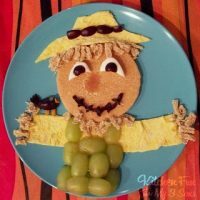 What a creative treat, I love it! 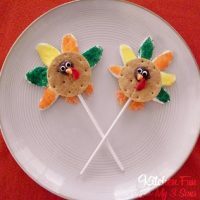 I'd love for you to share this on my Sweet Tooth Tuesdays link party, my readers would love it. This is so neat, my kids woulds love this. I have to pin. Thanks for sharing at Thursdays Treasures. I also tried that one and it takes me a couple of hours before I finished my so called masterpiece.